This time of year can seem filled with regret, especially among those students and teachers who have enjoyed a long reprieve from school. But every day brings us closer to another migratory season. Who could regret that? I was both shocked and thrilled to spot a Common Nighthawk soaring over the Bronx during my visit this weekend; funny that I never saw one when I lived there! Corey spent much time on the East Pond of Jamaica Bay this weekend and saw lots of shorebirds. One, however, stood out from the rest. American Avocet is always a good bird in New York State and it is Corey’s Best Bird of the Weekend. An invidious choice after a fine bird-filled week in southeast Arizona. But pace my beloved rufous-winged sparrows, I have to say it was the sulphur-bellied flycatcher bathing and preening in upper Madera Canyon on a thundery Saturday afternoon. Not a rare bird or a surprising one, but it always strikes me as particularly exotic. I was delighted to wake with the early Saturday sunrise to the calls of a Fish Crow. (One of the birds that I missed during my three years in Chicago) My neighborhood is a mile from the nearest body of water (and that’s just a little creek) so I have no idea why it was visiting — that’s my first sighting in Philly. It lingered in our courtyard for about half an hour, shifting from high up one evergreen to another, and left when a more distant Fish Crow vocalized. Simple bird but a lovely experience! 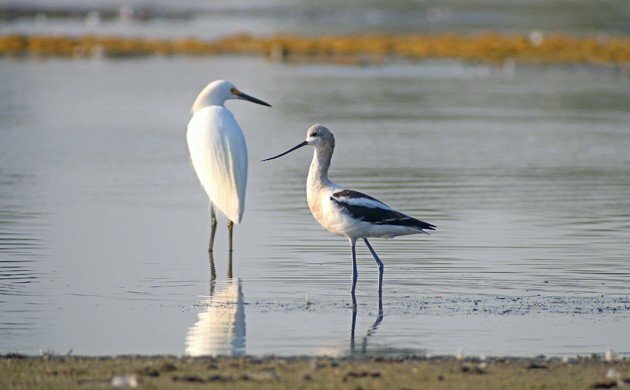 My best bird was also the American Avocet, in fact about 200 of them, because I wasn’t at home on the Olympic Peninsula (where we never see them), but in the San Francisco Bay Area at Don Edwards National Wildlife Refuge. They are lovely to watch as they step carefully through the water with their powder blue legs. I drove an hour from my home in Morelia, Mexico, down to an altitude of 1,000 m in our state’s Tierra Caliente. The first bird to greet me was a lifer, the Black-chested Sparrow. A beautiful bird, with a rollicking song. A juvenile Brandt’s Cormorant, seen along the Ballona Creek on a walk with Los Angeles Audubon. I had not intended to participate on this walk, I didn’t even know about it, but when I pulled up to the lagoon at Playa del Rey I saw a large group of Tilly-hatted people with binoculars and I knew I had chanced on my tribe. The cormorant was a nice surprise too, only my second sighting of this species.